The BD FACSCanto system breaks new frontiers in flow cytometry by providing an efficient, easy-to-use yet powerful six-color benchtop analyzer. It incorporates many technology advances first developed in the BD LSR II expandable analyzer and the BD FACSAria cell sorter. It supports a broad range of research applications, being particularly suited for rare event analysis with its high speed, great sensitivity, and minimal sample-to-sample carryover. The BD FACSCanto system combines a patented optical design for enhanced signal retention on six fluorescent and two scatter parameters, digital electronics for processing up to 10,000 events per second, and a novel sample injection tube supporting carryover of less than 0.1%. Your total benefit consists of the best fluorescence sensitivity to resolve dim events, cleaner data due to minimal sample contamination, and rapid processing rates, preserving valuable time for science. BD FACSCanto performance overcomes obstacles in rare event analysis and in functional studies for low detection ranges. 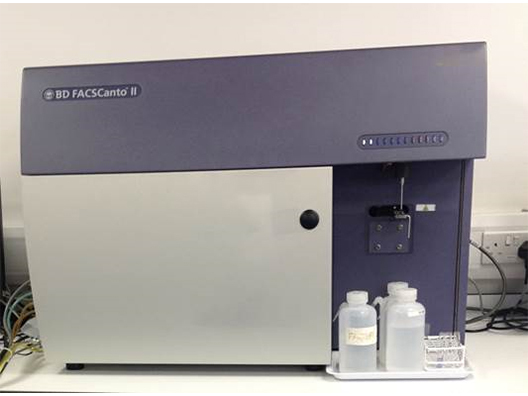 Thank you for your interest in the BD BioScience FACSCanto II 2 Laser Flow Cytometer (ID #: 17183). To speak with a representative, please fill out the contact form below or call us directly.